The Appalachian Laboratory of the University of Maryland Center for Environmental Science is located in Frostburg, Maryland. AL's main phone number is 301-689-7100. From Baltimore: Take I-70 west through Frederick and Hagerstown. Continue on I-70 for about 26 miles to Hancock and take the exit for I-68 (left exit) heading towards Cumberland and Morgantown, WV. 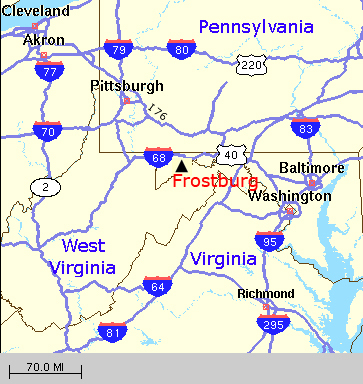 Continue to the second exit for Frostburg, Exit 33 (Midlothian/ Braddock Road). Bear right and proceed about a quarter mile down the hill on Braddock Road. The Appalachian Laboratory will be on your left, set back in the woods. If you get to the bottom of the hill at the main campus of Frostburg State University you have gone too far. From Washington, DC: Take the Capital Beltway (I-495) to I-270. Take I-270 north to Frederick. Join I-70 west and follow instructions from Baltimore as described above. From Morgantown, WV, and west: Take I-68 east to Exit 33 (Midlothian/Braddock Road). Turn left onto Braddock Road and proceed approximately one quarter mile down the hill on Braddock Road. The Appalachian Laboratory will be on your left, set back in the woods. If you get to the bottom of the hill at the main campus of Frostburg State University you have gone too far.